Whether it’s the natural next step for an already established brand, or a brand-new apparel line, there’s never been a better time to start an online t-shirt store. Ecommerce platforms are easier to use than ever, with expanded features and sleeker, more customizable templates. Social media has given people the ability to reach customers who otherwise wouldn't have seen their products and there’s an increasing culture of support for designers, artists and small businesses. 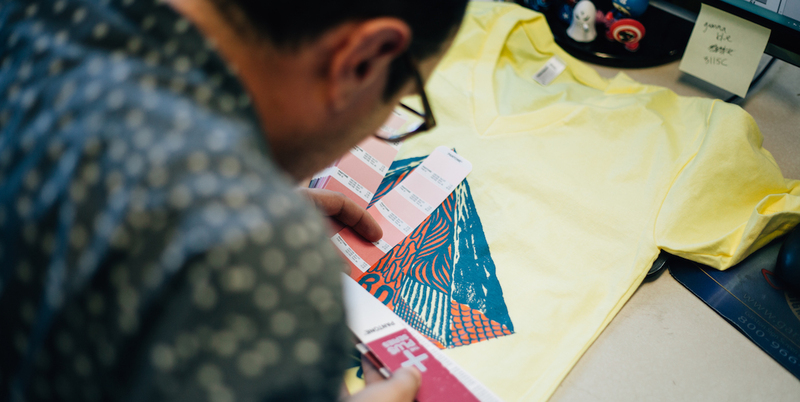 If you’re looking to add merch to your company's arsenal or you’re ready to side-hustle with your own custom tees, here’s a step by step guide to opening your ecommerce site, with tips and tricks for everything along the way. Whether you have a completed graphic or an idea that’s still in its conception, it’s your design that will create customers. It’s important to think about what type of apparel you’re creating and who it will appeal to. Find your people. By catering to a specific interest or niche, your business won’t only stand out, it’ll be easier to keep your designs focused, consistent and geared toward your target audience. If you’re less aesthetically oriented but still want to use your ideas in a custom design, don’t be afraid to ask for help. Your local community is a great place to start. You may be surprised to find that a favorite artist takes commissions and would gladly help with your graphic. Fiverr and Dribbble also offer a selection of artists and designers who are willing to provide freelance services. After you have your design ready, it’s always a good idea to get a second opinion (or 3, or 4 or more…) Online communities like Reddit are a great place to workshop your design. There’s tons of relevant subreddits, like this streetwear startup, where you can get honest feedback and responses - and it might just spark the interest of some future customers! It’s your product that will turn one-time buyers into return customers who will review and promote your apparel. For this, you want a professional print on a high-quality shirt. Your design, your target audience and your company goals will dictate a lot of your decisions as you start to create your apparel line. It comes back to knowing your people: It’s important to choose a tee that fits your target audience and your designs intended purpose. If your apparel is going to be the next big thing for workout wear, you’ll want to choose lightweight, poly garments that keep your customers cool and comfortable while they are breakin’ a sweat. If you see your tee paired with sweatpants and slippers, move toward a comfy tri-blend shirt with ulta-soft water based ink. More than anything, know what matters most to you. Whether it’s eco-conscious garments or high-performance athletic apparel, prioritize the aspects of your design ethos that you care most about and accentuate them as you move from graphic to fabric. 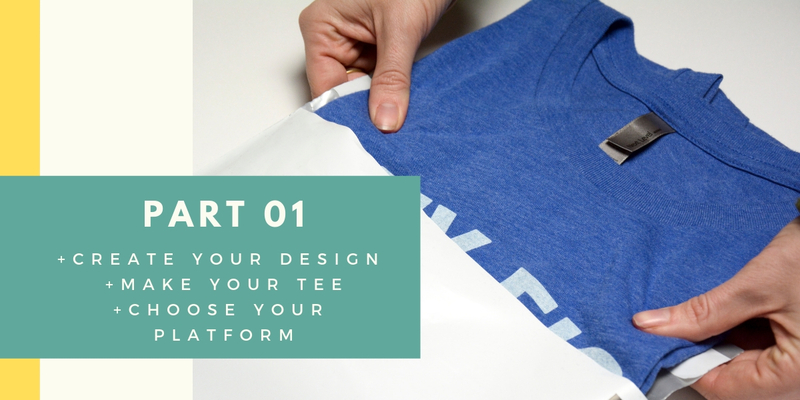 There’s a ton of details you’ll want to consider when designing your custom tees, and the options can be overwhelming. A good sales rep will be able to answer any questions about fabrics, inks, fits, and order quantities. And don’t be afraid to start small. You’re better off with a few well-executed, thoughtful products than a big store of half baked designs. Looking for ways to cut cost on your order without compromising quality? You can find some helpful hints here. Finishing services can add a little something extra to your apparel and give you the chance to let your customers know the important details. They are an easy and relatively inexpensive way to create high-end looking products, make your brand instantly identifiable, and create continuity between different garments or lines. 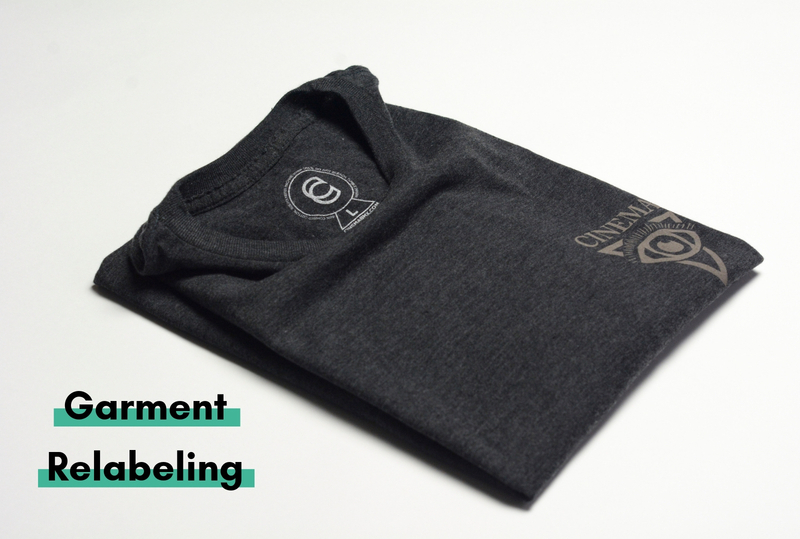 Garment Relabeling: Also known as Tag Printing, the manufacturer's labels are removed and replaced with your own custom tag, which can include anything from your brand logo to your company's mission statement. 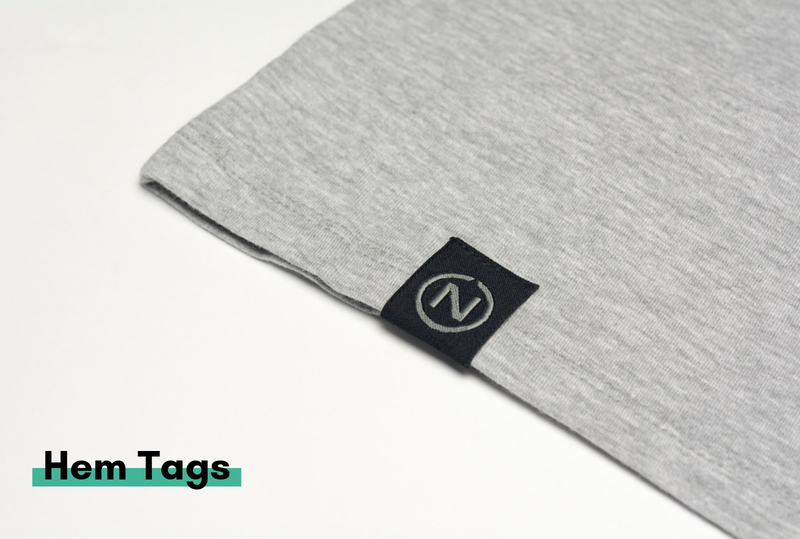 Hem tags: These little cloth labels often located on the bottom hem of a garment (though they are increasingly popular on the sleeve or neckline.) They allow your logo to be visible even when the apparel is worn. 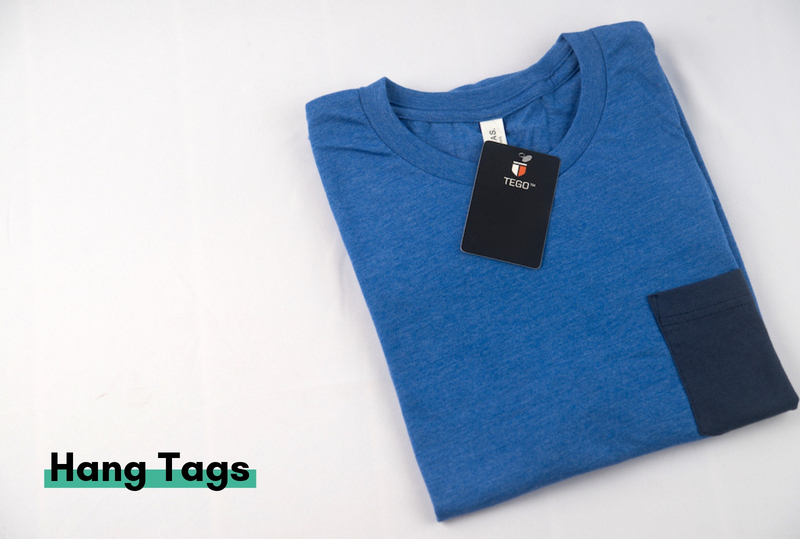 Hang Tags: Commonly put in the neck or the armpit, hang tags give you another opportunity to draw attention to your branding, your logo, your company mission, and other details about your product or brand. As soon as you come up with your name, you’ll want to secure your domain. Many ecommerce sites will allow you to purchase your domain through the platform, while others you’ll need to secure the domain on your own. A few things to consider: your domain name should match your business name, be brandable and easy to type. If your dream domain is taken, try some slight variations, like adding your locality to your domain name. This can not only open up some otherwise taken titles, but it may also help with local SEO. If possible, try to avoid numbers, hyphens or any intentional misspellings that could make it difficult to customers to find your site. Next, you’ll want to choose your business model. Will you pack and ship your own products? Or will someone else handle fulfilment for you? For others, taking control of the entire process--the picking, packing and shipping from start to finish--works best. Many ECommerce platforms make this easier by allowing you to print shipping labels directly from the website and even schedule pick-ups with UPS or DHL. Whether you’re sending out your products yourself or involving a drop shipper, consider folding and/or polybagging as a finishing service. Having your garments neatly stored and marked with size stickers will not only save you a TON of space, but it’ll save you time (and minimize mistakes) when you go to pack your orders. Not to mention that a neatly packed product is a great way to show you care. Here’s the truth:. There are many ecommerce platforms and there really is no “best” - just what’s best for you. Think realistically about what’s important to you. If you’ve got a very specific vision, a design oriented platform with customizable templates is likely right for you. Do you expect to have a lot of packages sold internationally? Then multiple currencies is a feature you’ll want to look for. Look for a platform that suits your needs and budget. Many platforms offer a free trial so you can play around with the sites before making a commitment. There are so many platforms and new ones are popping up all the time (we see you, Squarespace Commerce.) We’ve put together some notes on a few of the most popular that cater to many different types, and sizes, of business.